Kalank actor Madhuri Dixit Nene says it was tough and emotional for her to play a role which was to be originally essayed by the late Sridevi, report Hindustan Times. Madhuri plays Bahaar Begum in Karan Johar's multi-starrer production Kalank. After Sridevi's demise last year, the role was offered to Madhuri. 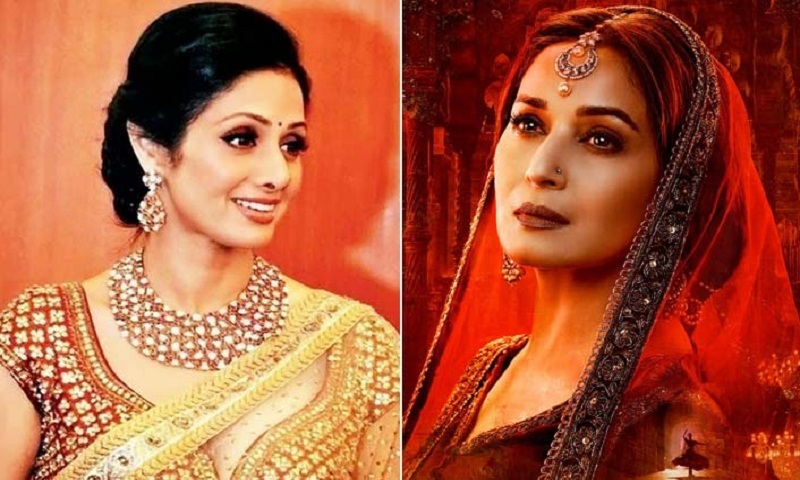 At the film's teaser launch in Mumbai on Tuesday, Madhuri was asked about how she felt on the sets of "Kalank" knowing that the character was supposed to be played by Sridevi. She said: "Firstly, her demise was sad news for us and when I was approached for the role, it was not easy for me. I have immense respect for her. She was a good artiste and a good human being too. To step into the role, when you look into it as an actress, it's a different scenario as you add your own inputs to the character, but we used to remember her on sets as she was a part of the film. Once you start working, you have to move on and do your job... I did that, but missed her too." Directed by Abhishek Verman, Kalank, featuring Sanjay Dutt, Varun Dhawan, Aditya Roy Kapur, Alia Bhatt and Sonakshi Sinha, is releasing on April 17.